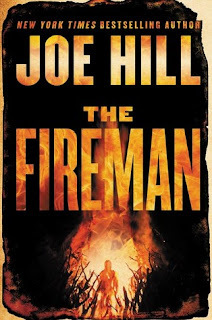 This 700+ page book is a pleasure to read - the mind of Joe Hill is a fascinating place to be and, like his father (Stephen King), he throws in Easter eggs which always puts a smile on my face. 😊 I randomly came across NOS4A2 one day, read it, LOVED it and was then obsessed with Joe Hill. Then I found out who his father was and it all made sense. Talent runs deep in this family. Since then I've read Heart Shaped Box and have Horns, Locke & Key and 21st Century Ghosts slated to read in the not so distant future. He seems to delve into different genres and writes effortlessly. Do yourself a favor and pick up one (or all) of his books! Dragonscale is an apocalyptic epidemic where a spore causes beautiful scales on the epidermis that causes a person to glow, but eventually also to burn. Harper, a nurse, tries to help those that are "sick" and ends up catching the Dragonscale while also finding out that she's pregnant. The journey that sets forth is not just her fighting for survival, but fighting to survive long enough to have the baby. In her journey she meets The Fireman and a group of survivors who reside at a camp. From here you see how people react to survive in different situations and how the smallest of changes can propel a person, or group, to take drastic action. Joe Hill writes with such ease. For such a monster of a book, I was entertained the entire way. I learned a slew of new hilarious swear words that I'm adding to my arsenal, and the humor throughout this book was on point. He has numerous amounts of pop culture references that I found highly entertaining. There were so many that I probably missed a few and I can see how people would think it was a bit over saturated with them - but I enjoyed them and because I read this slower than I normally would have, it didn't seem as overwhelming with them as people had mentioned to me. His nod to NOS4A2 (my first and still favorite) made my heart smile. Although the book is titled The Fireman and he plays an integral part throughout the book, I found that the main characters (good and evil) were mostly women. Kudos to you Mr. Hill. I loved and hated each one immensely. A full five stars because I closed the book satiated, entertained and while part of my didn't want it to end, I'm happy it ended where it did. I have to say, I never heard about this book before reading your review and now it's all I want to read!! It sounds really interesting and I'm intrigued by all these female characters!